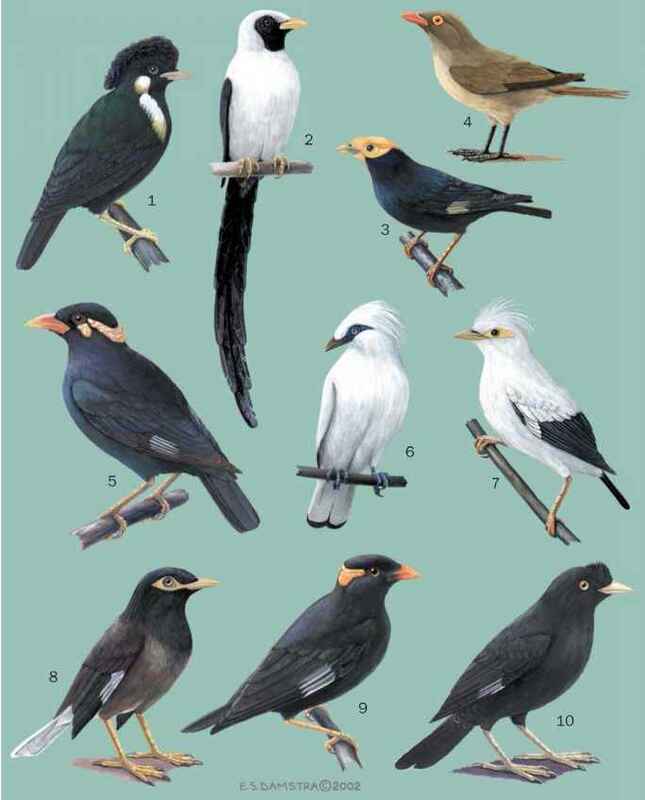 English: Ceylon myna, Sri Lanka hill myna, grackle; French: Mainate de Ceylan; German: Dschungelatzel; Spanish: Maina de Ceilon. 9.1-9.8 in (23-25 cm). A small, stubby black myna with a white stripe through the primaries, orange bill that is dark at the base, yellow legs, and a bare yellow nape wattle. Gregarious and arboreal, rarely coming to the ground; typically found in pairs in colonies; wings produce a loud humming sound in flight; an excellent mimic of the human voice. Diet mainly fruit, especially figs, and seeds. Cavity nester, nesting February-May and sometimes in August-September. Cavities sometimes used without nest materials, but a nest of grasses and other materials is usual. Clutch normally includes two Prussian-blue eggs mottled with reddish brown. No information available on parental care.